Living in Gates Mills, Ohio for more than 20 years, it was an honor to be able to visit this elementary school and talk to kids about kindness. 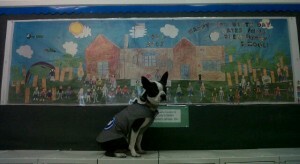 Mary Myers, principal (and dog handler) (Bogart), was very complimentary about our visit to her small school. One-hundred twenty very well behaved students loved the puppet show and presentation. Bogart, of course was also a big hit with everyone. Gwen Byrne, one of the teachers and fellow intrepid traveler, gave me her copy of a book, which is a major time-saver for anyone living on the road. This morning, I started my day at Millridge Elementary, giving three presentations to classes of students who didn’t see us on Wednesday. Lou Kindervater, principal of this wonderful “neighborhood” school, and Anita Davidson, Guidance Counselor, were once again a very big help with my mission and our visit to this school. A big Kindness Bus Tour thank you goes out to Jenifer Wexler who was a big help with Bogart and also provided delectable culinary necessities. This entry was posted on Friday, September 17th, 2010 at 12:01 pm	and is filed under Kindness. You can follow any responses to this entry through the RSS 2.0 feed. You can leave a response, or trackback from your own site.